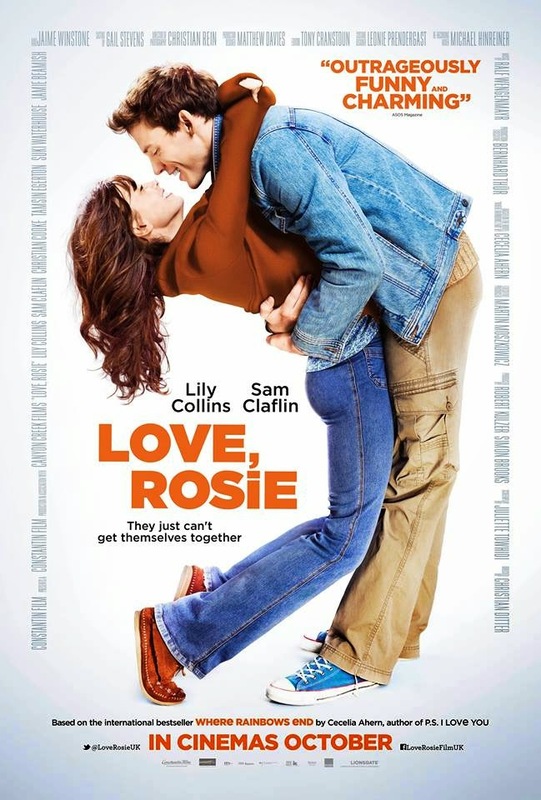 Staring Lilly Cole (of mortal instruments fame) and Sam Claflin (who you may know better as Finnick Odair from the Hunger Games) LOVE, ROSIE centers on Rosie and her best friend Alex who take a leap of faith, both on life and on each other, when they decide to go to the US together to attend university. But fate has other plans for Rosie. Over the next 12 years their lives change dramatically but the connection remains. This was one of those films which I went into with a lot of preconceptions, thinking that I probably wouldn't like it, and had all of them broken down second by second. I enjoyed this film, and I’m not afraid to say so! It’s a little like someone took One Day, and then smashed it into Juno, the result of which was a heartfelt film with some very funny moments. And where one day flittered about with its pace (I promise I’ll stop mentioning One Day now) the flitting in this film worked really well. It gave it a good pace, yet things weren't rushed or focused on too much, and that matched the quick rapid flow of the book. The book itself, if you haven't yet read it, is written in the form of letters and emails between the two and although initially I found it hard to click with this style, you suddenly forget that your're reading a book as you become a fly on the wall to their lives. The film was just like this and the way it drew out these epistolary elements and made them a part of the action made the moments feel more real. As for the cast themselves, Lilly and Sam worked well together, their friendship made sense and it worked (though she never seemed to age, so I’d like to order a million bottles of whatever water she’s drinking!). Jaime Winstone was a fantastic support breaking up the narrative with comic flair. At times however some of the other supporting relationships felt unnecessarily exaggerated, and whilst this had some comedic moments, there were times when it all just felt too much, and the film was shouting 'this relationship clearly isn't working at you'. This was a film of snapshotted moments (i know that's not a word, but for all intended purposed it is now) . It was relatable, and that I think everyone has had a time where they can see something of their lives in it ( or maybe i'm just sharing way too much about my life!). It had me both laughing, and at points I may have had a tear in my eye....but that’s what makes a film! It was my guilty pleasure it will probably be yours too. Let us know what you thought of the film!! I am so excited to see Love Rosie I am going to see it next week for my birthday. Where Rainbows end is one of my favorite Cecila Ahern books!